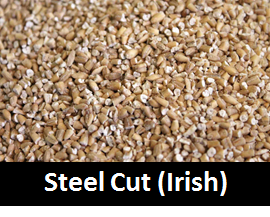 Steel-cut oats (Irish oats): Made by cutting oat groats into tiny pieces. Steel-cut oats are chewier than traditional oats, are digested more slowly, and may provide longer satiety. This type of oatmeal takes about 30 minutes to cook. This should be your go to for breakfast cereal. See the steel cut oatmeal blog on how to cook this super easy. 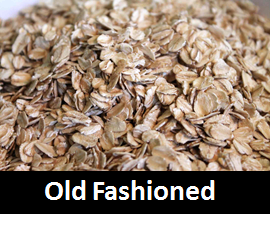 Rolled oats (old fashioned): The most common form of oatmeal. 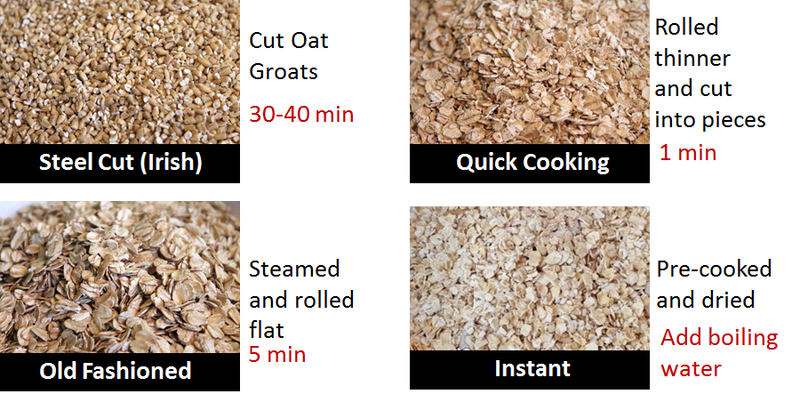 Rolled oats are made by steaming oat groats that are then flattened (rolled) to create oat flakes. Rolled oats cook in about five minutes. Another great choice for breakfast. Many recipes call for old fashioned oats as a binder or for dishes that will be cooked for a longer period of time. 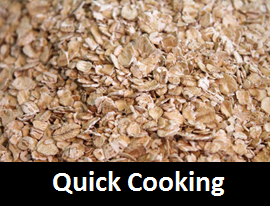 Quick cooking oats: To make this type of oatmeal, rolled oats are pressed into even thinner flakes and cut into small pieces. This type of oatmeal cooks in about one to two minutes. Not as good for a breakfast cereal as it does not have the satiety of steel cut. Some recipes will call for this if they do not have a long cooking time. Check out this wonderful banana pancake recipe that uses quick cooking oats. Instant oatmeal: Oatmeal that has been precooked and dried. To cook, you simply add boiling water. 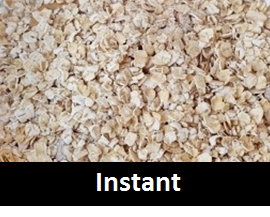 Instant oatmeal is fast, but it does not have the distinctive chewiness of regular oatmeal. Also, many types of instant oatmeal have added sugar. There is one great use for this type of oatmeal – traveling. If you only have access to a coffee pot and not a stove or microwave, you can make oatmeal on the go. Just choose a plain variety and bring a banana. To learn more about the importance of whole grains, check out this recent Mediterranean Diet webinar: Steps to Eating the Med Way: Eat More Fruits, Vegetables, and Whole Grains. I like the old fashion oatmeal. I will give the steel cut a try. It will be different. Thanks. Let us know what you think, Linda! Can I use steel cut oats for overnight recipes? Thanks for your question. You need to use old fashioned oats for overnight no cook recipes. The steel cut oats require cooking.